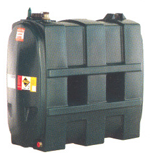 Plastic bunded oil tank suitable for the storage of heating oil, supplied complete with electronic tank contents gauge, bund warning alarm, failsafe overfill prevention capability and tank fitting kit. All Harlequin Plastic Bunded Oil Tanks are fully compliant with all relevant requirements contained within The Control of Pollution (Oil Storage) (England) Regulations 2001 and all comparable requirements throughout the United Kingdom, Republic of Ireland, Channel Islands and Isle of Man. Plastic single skin oil storage tank, supplied complete with 1” Outlet; 2” BSP Fill Point; 4” Inspection Aperture; Remote Electronic Tank Contents Gauge; and, Tank Fitting Kit. 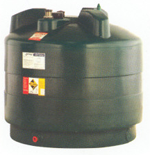 When installed at agricultural, commercial, industrial or institutional installations – this tank must be placed within a suitably bunded area, subject to local Environmental Regulations. At domestic installations, an Environmental Risk Assessment must be undertaken, prior to the installation of any single skin oil storage tank. Please note this product is not suitable for connection to gravity fed diesel delivery systems, incorporating a flexible hose and trigger nozzle. Plastic oil tank suitable for the storage of heating oil, supplied complete with electronic tank contents gauge, bund warning alarm, failsafe overfill prevention capability and tank fitting kit.